See Archive On The Right For More Articles! ACT Advanced Conservation Tech - Save Money, Water, and Energy! With the costs of energy (and water) skyrocketing we wanted to highlight a very impressive product that can help you mitigate some of those increased costs: The ACT Advanced Conservation Tech D'MAND® SYSTEM. How does the ACT Advanced Conservation Tech system work? The ACT Advanced Conservation Tech SYSTEM is an electric water pumping system that quickly (typically within 30 seconds) brings hot water to the fixture by pulling water from the hot water tank and returning ambient house temperature water back to the hot water tank or tankless heater. The D'MAND® system is usually installed under the sink farthest from the water heater. When activated, it circulates the ambient house temperature water normally discarded down the drain, back to the water heater through the cold water line. At the same time, the D'MAND® system pumps hot water rapidly from the hot water heater to the fixture. When hot water is detected in the line the pump stops automatically and hot water is available at the faucet. In typical residential applications it costs less than $1.00 per year to operate the pump. It can be activated by any combination of methods such as buttons, wireless remote control, or motion sensors. Life expectancy is 15 to 20 years and servicing is not required. The ACT D'MAND® KONTROLS SYSTEM pump (C1-100 models which replace the S-70 and S-02) and the Laing AutoCirc E10 are the only pumps on the market approved for use with tankless water heaters. Smaller pumps available from other manufacturers do not have enough volume or pressure capability to activate most tankless water heaters. 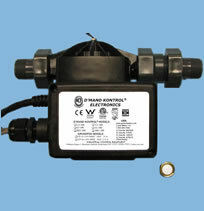 - Saves energy and water: The loss of water while waiting could be 3 to 7 gallons. Since most homeowners do not stand and wait for hot water to arrive, another 1 to 3 gallons may be lost before they notice hot water has arrived. - Easily installed in new or existing homes. - Will work with any water heating system. - Typically installed within two hours or less on any existing or new home. Does not require major plumbing. - Return on investment: Will have a payback of one to three years. - Extends water heater life. - Reduces sewage and air pollution. Water savings for a household of four occupants varies from about 900 gallons to about 3000 gallons per point of use, per year (DOE study). Point of use is a single location at a home, for example a faucet where hot water is available. The water savings in a home with four points of use, on the average, would be 3,600 to 12,000 gallons per year. 1. Standard retrofit plumbing: The majority of homes are plumbed in this manner. Depending on where the fixtures are located, the hot water line runs as a main line then branches to the fixtures. In most cases, the branches are short and the main hot water line is long. Hardwired and wireless buttons can be used to activate the system from multiple locations. 2. Structured Plumbing®: Locate the pump and the controls at the water heater on the dedicated return line. Hardwired and wireless buttons can be used to activate the system from multiple locations. Images courtesy of ACT Advanced Conservation Tech. As always, if you would like to ask more questions about this or other technical topics give us a call at 877-711-4822 - 9-5 PST. Live people for technical and sales support - an Internet first!